After a massive 39.5% drop in full-size truck sales last month, the General has decided to follow Ford by upping the incentives on the off-roadin' people-haulers. But not only are they dropping more dollars on the hood of the basic one-powertrain models, they're dropping the same levels of cash on the new two-mode hybrid versions of GM's GMT-900 SUV twins — the GMC Yukon and Chevy Tahoe. While we're not surprised at seeing up to $6,000 thrown on the hood of the non-hybrid Tahoe and Yukon, a $4,000 owner loyalty rebate on the hybrids seems a bit surprising. Isn't this a hybrid sellers' market? Full incentive breakdown after the jump. 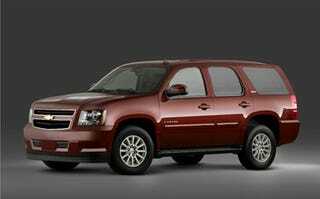 • Chevrolet — Tahoe (nonhybrid) or Suburban: $2,000 customer cash + $4,000 owner loyalty bonus cash = $6,000 total cash. Tahoe (hybrid): $0 customer cash + $4,000 owner loyalty bonus cash = $4,000 total cash. Silverado or Avalanche: $2,000 customer cash + $3,000 owner loyalty bonus cash = $5,000 total cash. • GMC — Yukon: $2,000 customer cash + $4,000 owner loyalty bonus cash = $6,000 total cash. Yukon (hybrid): $0 customer cash + $4,000 owner loyalty bonus cash = $4,000 total cash. Sierra: $2,000 customer cash + $3,000 owner loyalty bonus cash = $5,000 total cash. • Cadillac — Escalade: $2,000 customer cash + $2,000 bonus cash + $2,000 owner loyalty bonus cash = $6,000 total cash.